As we turn the page on another year and look forward in anticipation of what 2019 has in store, we need to look back and reflect on both the good and bad of 2018. It goes without saying that Hurricane Harvey still casts a very large shadow on our region, and virtually everything we do now in our government affairs efforts and advocacy is viewed through a post-Harvey lens. That will continue to be an important factor as we enter into 2019 because every odd numbered year means the Texas Legislature meets in Austin again starting in January. Our government affairs team anticipates being very active in Austin, along with TAB, as the legislature considers thousands of pieces of legislation that can impact the housing industry and Harvey recovery. I said it in 2016 and it applies again in 2018: Wow. Unlike what we saw on the national level in 2016, these results were not entirely unexpected. As with every midterm election, the President’s party will see some losses and this year was no different. That said, those losses were not only felt in Washington, but at the Capitol in Austin and down ballot here locally. In Washington, Senate Republicans were able to maintain and actually add to their majority, now holding 52 out of 100 seats. In the House of Representatives, however, Democrats were able to pick up 37 seats and at the time of printing (with three races still undecided) hold a 232-200 advantage. Unlike in years past, Texas incumbents were not immune to the political winds that we saw nationally. In Washington: In a race that a year ago would have been considered an easy win for incumbent Senator Ted Cruz, he narrowly defeated Congressman Beto O’Rourke by roughly 200,000 votes out of the over 8 million cast. Locally, in a race that was targeted nationally following Hilary Clinton’s defeat of President Donald Trump by 1% in the district, longtime incumbent Congressman John Culberson was beaten by first time candidate Lizzie Fletcher in the race to represent Texas Congressional District 7. In Austin: All statewide Republicans, including Governor Greg Abbott, Lt. Gov. Dan Patrick, Attorney General Ken Paxton and Comptroller Glenn Hegar won reelection, although the numbers were the closest in more than a decade. The Texas Senate Republican’s majority has shrunk to 19-12, losing one net seat. The significance of that number is that 19 votes are needed to bring any piece of legislation to the floor. The biggest gains for the Democrats were in the Texas House of Representatives, where they picked up 12 seats. While they are still in the minority, the current House makeup is now 83 Republicans and 67 Democrats. In our delegation, we saw 12-term incumbent State Rep. Gary Elkins (R-Jersey Village) defeated by engineer Jon Rosenthal by 1,700 votes to represent District 135. In District 132, incumbent Rep. Mike Schofield (R-Katy) lost by only 113 votes to Gina Calanni in the race to represent West Houston and Katy. In Harris County: All county-wide elected Republicans lost. This included County Judge Ed Emmett, District Clerk Chris Daniel, County Clerk Stan Stanart, County Treasurer Orlando Sanchez and every sitting Republican judge and candidate for district judge. In addition, County Commissioner, Precinct 2 Jack Morman also lost. In Fort Bend County: County Judge Bob Hebert lost to KP George by nearly 15,000 votes and County Commissioner, Precinct 4 James Patterson was beaten by roughly 2,300 votes by Ken R. DeMerchant. Elections are fluid and this one produced some surprising results and unexpected winners. The GHBA Government Affairs team and HOME-PAC have already started to meet with and engage with the newly elected officials that will be sworn in to represent these seats starting in 2019. That said, mark down March 20 on your calendar for Rally Day! It’s our biannual opportunity to visit our state capitol and advocate for pro-housing issues. In April following more than two months of the GHBA’s advocacy efforts, the Houston City Council voted to dramatically increase regulations on building within the 100 and 500 year floodplains. The proposal to amend Chapter 19, the City’s Floodplain Regulation Ordinance, was first introduced in late January and was uncharacteristically fast-tracked through the ordinance revision process. The GHBA was engaged on this issue from before it was rolled out through its passage. We met with Mayor Turner, all 15 council members (and some many times), Houston Public Works Director Carol Haddock, Chief Resiliency Officer Steve Costello, Chief Recovery Officer Marvin Odum and Floodplain Manager Jamila Johnson on multiple occasions to voice our concerns about the unintended consequences of a major, but lightly vetted policy change and work with them to make adjustments. Numerous GHBA members spoke during committee hearings and Public Council Session. Ultimately, we worked with our development stakeholder partners in drafting amendments for this ordinance to address the no net fill prohibition and height requirements in both the 100 and 500 year floodplains. Those amendments were dutifully carried by council members Greg Travis and Jack Christie. Despite the GHBA’s efforts, the mayor’s ordinance revisions passed with a vote of 9 to 7 and the amendments were defeated. We were one vote shy of this not passing as an 8-8 vote would have defeated the measure. Additions larger than 1/3 of an existing property in the 500 year floodplain must be raised to the 500 BFE, plus two feet. In addition to the changes to Chapter 19, the mayor directed Chief Resilience Officer Steve Costello to review Chapters 9 and 13 of the Infrastructure Design Manual (IDM) that govern stormwater infrastructure design and quality. To conduct this review, Costello formed a taskforce of roughly 50 people including a GHBA representative and some industry stakeholders, along with neighbor groups, green proponents and non-development interests. The administration wanted all these changes to coincide with the anniversary of Harvey and they went into effect on September 1, 2018. In May, members of the GHBA Government Affairs Committee attended a meeting with Congressman John Culberson (CD-7) as a part of the NAHB’s “Bringing Housing Home Week.” During this week, local home builder associations were encouraged to meet with members of their congressional delegation in an effort to discuss pressing issues affecting the industry. 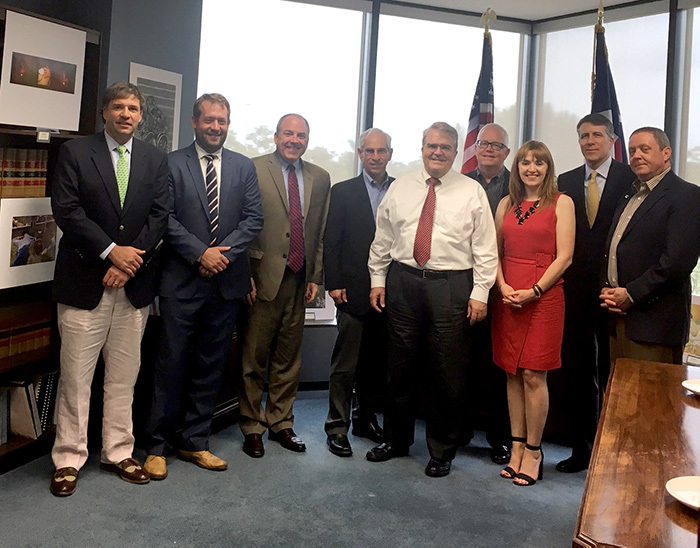 During the meeting with Congressman Culberson, GHBA members discussed soaring lumber costs, the need for a more robust workforce in the residential construction industry, the increasing costs of health insurance, and most importantly, thanked the congressman for his work and leadership in securing federal funds for the Houston area to be dedicated to flood mitigation projects in the aftermath of Hurricane Harvey. The GHBA is a founding member of Houston Stronger, which is a coalition of development stakeholders from around our region. The group’s initial purpose was to push for the $2.5 billion Harris County Flood Control bond election to help fund a comprehensive regional flood control plan and educate both elected officials and the public about the need for major flood improvement projects in the Houston area. The bond election was officially called in June and a public awareness campaign began to get out the vote in favor of the proposition for the August election. Harris County Judge Emmett formed the Fight Flooding PAC specifically to fund this campaign which was a comprehensive, countywide political type campaign, with grassroots outreach, mail, TV buys, digital strategies, etc. The GHBA was an integral part of the Fight Flooding campaign and participated in strategy and fundraising efforts throughout. Not only did the GHBA HOME-PAC contribute, we had dozens of GHBA members and member companies contribute substantial dollars to support the campaign’s efforts. Due in large part to the effort of our industry, the voters of Harris County overwhelmingly approved the proposal that will help fund flood mitigation and improvement projects to make our region more resilient against future flooding, including increased bayou conveyance, strategic property buyouts, additional detention, desilting drainage channels and right of way acquisition to preserve natural floodplains. It is a credit to our industry that we recognized that to continue responsible growth and home affordability in our region, we must address our long ignored flooding issues. And you all stepped up! There was much confusion this year over the implementation of the Environmental Protection Agency (EPA) and the U.S. Army Corps of Engineers (the Corps) joint Clean Water Act (CWA) “Waters of the U.S.”(WOTUS) definition and rule. The new rule would have dramatically expanded jurisdiction under the Clean Water Act and the ramifications of the rule would have been severely punitive on business—especially for the home building, land development, construction and transportation infrastructure sectors. On November 9, 2015, the GHBA, along with other local development stakeholders (TARGET), filed a Petition for Review with the Sixth Circuit in an effort to fight against this government overreach on property rights. On February 22, 2016, the Sixth Circuit panel asserted jurisdiction over the appeal and issued a nationwide stay which delayed the implementation of the 2015 Rule. In late January of this year, the Supreme Court ruled unanimously that the Sixth Circuit Court did not have jurisdiction to be the sole venue for the hearings. Shortly after that ruling, the EPA and the Army Corps adopted a new rule that would delay any implementation of the 2015 Rule until 2020. On Aug. 16, 2018, the District Court for South Carolina ruled that the EPA had improperly added the 2020 implementation date to the 2015 rule. What that meant was that 26 states could have immediately been regulated under the 2015 rule—including Texas. However, in September Judge George Hanks Jr., of the U.S. District Court for the Southern District of Texas in Galveston, blocked implementation of the 2015 WOTUS rule in Texas, Louisiana and Mississippi.